Here's the first book in nearly 30 years to provide comprehensive coverage of the current state of hydrologic knowledge and practice--saving you hours of time tracking down the latest techniques in professional journals. 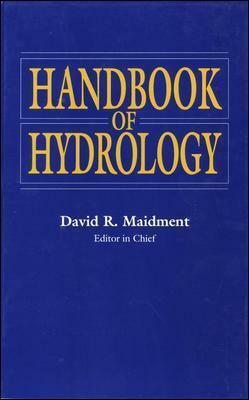 Maidment's Handbook of Hydrology includes the contributions of more than 50 international authorities, who provide you with practical methods of solving problems in every aspect of the field, including the increasing application of geostatistics and computer models. You'll discover more effective ways to. . .mitigate the impact of floods through better urban drainage; assess the water supplies of cities and farming areas; prevent the pollution of natural waters; halt the damaging effects of erosion; protect wilddlife and preserve wetlands; contain and remove contaminants in waterways; and much more. Now when you need to understand an unfamiliar term or a new subject area, obtain a formula, find a computer program for solving a problem, obtain values from a map or a table of data, or convert hydrologic units, this is the only source you'll need. A must-have reference for anyone involved in hydrology, environmental pollution, urban drainage, water resources planning and management, and related fields, the Handbook of Hydrology will prove to be indispensable to your work.